Rack ‘em up! 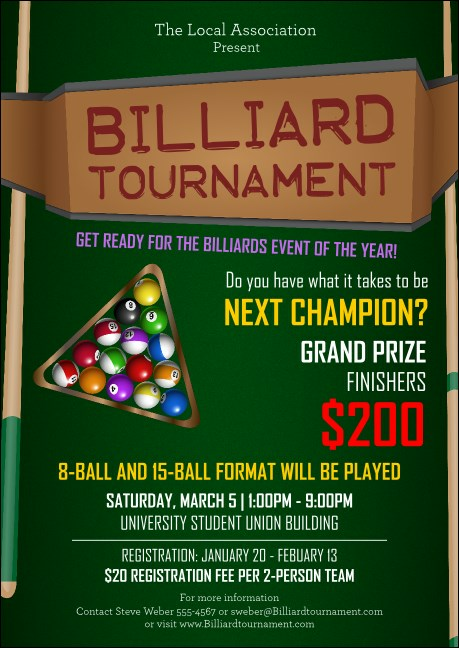 Laid out with pool balls and a cue, the Billiard Tournament Postcard will motivate pool lovers to save the date. This design’s green felt background pushes your event’s details to the forefront, making it easy for readers to determine who, what, where and when. Tailor to your needs by clicking the customize tab above. Size approximates: 4.25" x 6"
Score a huge crowd for your celebration with TicketPrinting.com.